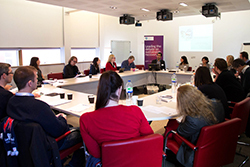 Last Friday saw SPERI co-host a seminar on The Political Economy of Wellbeing, the fourth event in the ESRC seminar series on The Politics of Wellbeing. The morning session focused on ‘narratives beyond GDP’ and included contributions on sustainable development from Prof John O’ Neill (Manchester University) and wellbeing from Prof Paul Allin (Imperial College and former Head of the National Wellbeing Programme at the Office for National Statistics). In the afternoon, discussion turned to ‘challenging established narratives in policy terms’, with contributions from Adam Corlett (Resolution Foundation), Juliet Michaelson (New Economics Foundation) and Dr Hayley Stevenson (University of Sheffield). 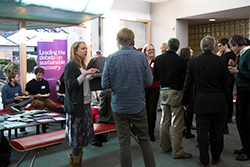 The event was attended by over 30 academics and policy-makers from a range of disciplines and organisations. Further details of the workshop (and presentations) will be uploaded to the Politics of Wellbeing website shortly (http://politicsofwellbeing.group.shef.ac.uk/). For further details about the seminar series contract Prof Ian Bache (i.bache@sheffield.ac.uk).